The city of Houston, which recycles only 6 percent of the waste it collects, has a new idea to improve that figure: Eliminate that extra blue bin altogether. The city of Houston, which recycles only 6 percent of the waste it collects, has a bold idea to improve that figure: Eliminate that extra blue bin altogether. Under the “One Bin for All” proposal the city is considering, Houston residents would not need to separate their paper, cardboard and soda cans from the rest of their trash. Everything will go in one giant — and most likely green — bin to be sorted elsewhere. The idea won the city a $1 million grant from Bloomberg Philanthropies, a project of New York City’s former mayor. But there are questions about whether the program will work, and many environmental activists fear it could discourage people from thinking about what — and how much — they throw away. "We're not paying the capital at all," she said. "Our goal is to keep it cost-neutral." 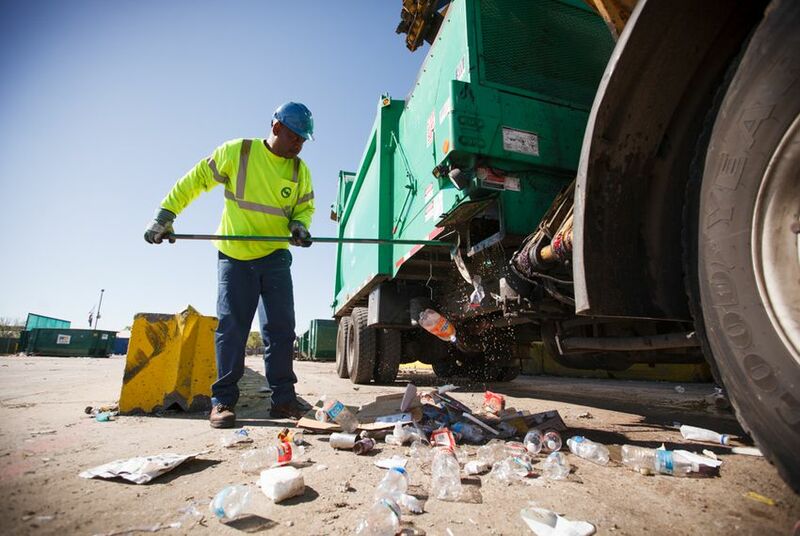 Sorting facilities “depend on workers to sort out the waste from the recycling, so whatever objects you’re telling people to throw in there with recyclables potentially creates dangerous working conditions,” Scruggs said. “Nobody wants to create jobs where you’re sorting through trash.” While Houston points to Roseville, Calif.'s one-bin system as a model, Scruggs said her group has visited the town's facility and found workers who had to sort animal waste from other trash, a potential health risk. “There's a huge interest in the topic," said Scott Pasternak, an environmental consultant who worked on the study. "It can technically be done, but the cost of doing that is going to be, at this point in Texas, substantially greater than existing technologies." Pasternak said landfill costs are much higher in California, which is why waste-to-energy strategies may be more feasible there. Pasternak has also studied the one-bin idea and found that it could be doable, but only in some cases. Office buildings tend to throw out a lot of paper and cardboard, so the strategy would work for commercial waste collection. But waste from residential homes is another matter. "It's going to be wetter and just a lot messier to sort out," he said. Other Texas cities are moving in a different direction. In Austin, nearly 8 percent of households are participating in a pilot program in which they separate food waste from the rest of their trash so it can be sent to a composter. For now, composters are happy to take the waste free of charge because there is a strong market for local compost, said Bob Gedert, director of Austin Resource Recovery. Eventually, the city hopes to expand the program to all its residents. That will require the city to buy $50 compost bins for more than 150,000 households but also save some money in landfill fees, which are about $21 per ton. But even in Austin, the recycling rate is just 24 percent, and the city charges residents more than $100 a year for its pickup services. Houston households pay nothing, and close to half still do not even have the conventional blue recycling bins. Spanjian said the one-bin concept is not a done deal. Residents could be asked to separate their food waste, put it in a loose bag and place it in a bin on top of the recyclables. That would still allow for cost savings by eliminating multiple truck routes.